Younce, Max - Who Can Forgive Sins -The Lutheran Minister, The Catholic Priest, Or Jesus Christ? Younce, Max - Truth About Evolution -- Don't Let Satan Make A Monkey Out of You! Dr. Younce has been in the ministry 40 years, having been ordained in 1970. He is a graduate of Florida Bible College and holds a Doctorate in Theology. He has pastored churches in Ohio, Indiana, Florida, and Minnesota. He is the founding pastor of Heritage Bible Church in Ohio and Heritage Baptist Bible Church in Walnut Grove, Minnesota. He and his wife, Marge, have made Walnut Grove their home since 1991. Dr. Younce's ministry has always been motivated by a caring evangelistic outreach. Thirty-six years of radio and recently television, bear this out. Teaching is another characteristic of Dr. Younce's ministry. This is evidenced by the many Bible Institute courses he has taught over the years. For a description of each book, or to download each book individually, click here. 2) Download and install the Max Younce e-Sword Collection by clicking the green Download button above on this screen. 3) Start e-Sword. Click Tools from the main menu and then click Reference Library. 4) Select any Max Younce title from the drop down menu or type "younce" into the "filter" field in the top, right corner. No portion of these publications may be reproduced, stored in any electronic system, or transmitted in any form or by any means, electronic, mechanical, photocopy, recording, or otherwise, without written permission from the author. Brief quotations may be used in literary reviews. Unless otherwise indicated, all Scripture quotations are taken from the King James Translation of the Bible. This text has been properly and carefully formatted for e-Sword (not an unattractive copy/paste job) with the author's blessing and permission. This file contains images that are not compatible with e-Sword 9. 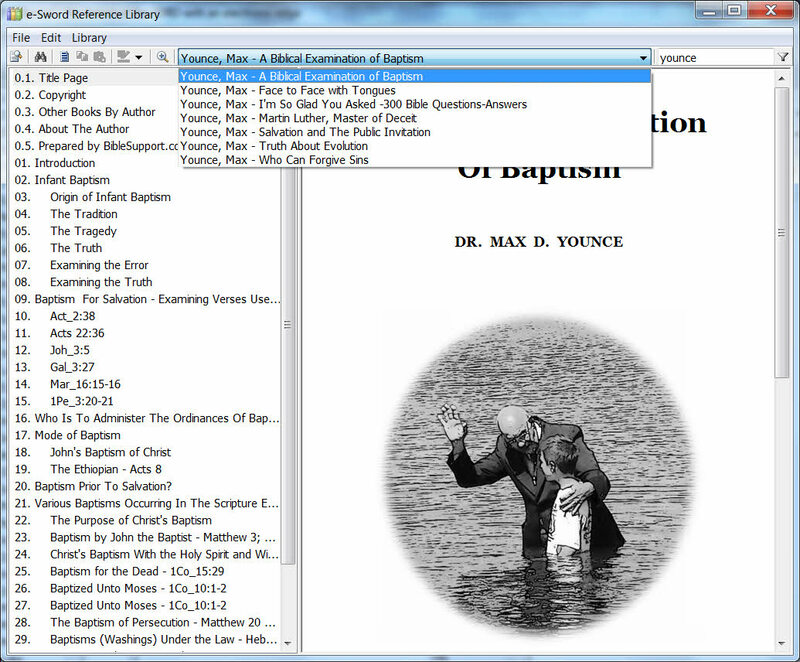 With a number of topical divisions, reading this resource in e-Sword 9's Topic Editor is unrealistic. Please upgrade to e-Sword 10.